As reported in ScienceDaily, an international team, including Oxford University archaeologists, has dated two explosions of sophisticated stone tool making in southern Africa much more precisely than has previously been possible. The team dated the two events, known as the Still Bay and Howieson’s Poort industries, to around 80,000 and 60,000 years ago respectively. This provides further evidence that humans (Homo sapiens) in southern Africa were "behaviourally modern" -- that is, thought and behaved like modern humans -- before any migration of biologically modern humans to the rest of the world: most likely dated at around 60,000 years ago according to the "Out of Africa" theory. 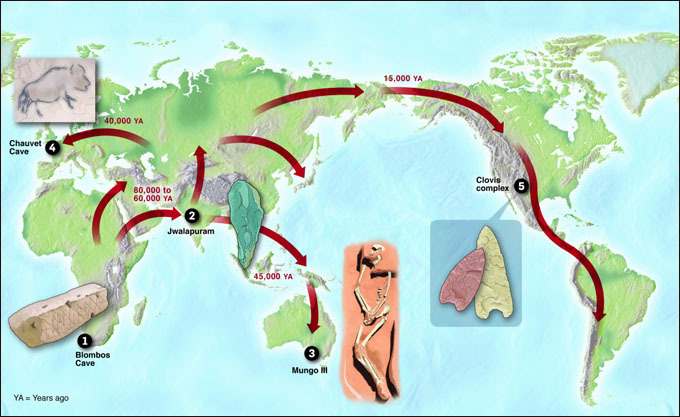 [above] Human migration pattern from Africa to Asia, Australia, Europe, and North and South America. Selected artifacts found around the world (1-5) are examples of evidence supporting the Out-of-Africa theory. According to both genetic and fossil evidence, archaic Homo sapiens evolved to anatomically modern humans solely in Africa, between 200,000 and 100,000 years ago, with members of one branch leaving Africa by 60,000 years ago and, over time, replacing earlier human populations such as Neanderthals and Homo erectus. Mounting evidence keeps pushing back the date when Homo sapiens (modern humans) fully developed in Africa. But, at the same time, some very recent archaeological discoveries in China have challenged the notion that the Africal version of Homo sapiens was fully evolved. The competing hypothesis is called the "multiregional origin" of modern humans. 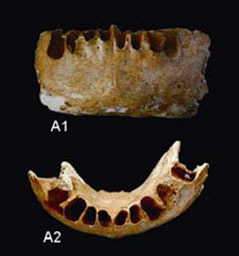 A recently discovered fossilized mandible [right] is putatively a hybrid between Homo sapiens and an earlier hominid, and is likely to be 110,000 years old. This discovery seems contrary to the "out of Africa" theory, since it suggests that Homo sapiens was capable of successful mating with more primitive hominids. Scientists had thought that, by then, the Homo sapiens would have already developed speciation, making them incompatible as mates with primitive hominids, prior to their migration to Asia. The debate is not yet resolved. The bone fragments are unique and leave room for different interpretation. Most anthropoligists still hold the Out of Africa theory as valid and continue to push the date of Homo sapiens back to 200,000 years BPE. "These new findings reinforce the understanding that we have to massively expand the timeframe over which people in southern Africa were no different from people today," said Professor Peter Mitchell of Oxford University's School of Archaeology. "We will now have to think much more creatively about the past and what sorts of sophisticated human behaviours were going on in Africa over this vast new landscape of tens of thousands of years." The evidence comes from archaeological sites in Lesotho and South Africa. 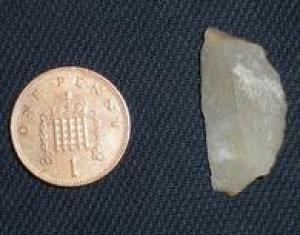 Characteristic of the older Still Bay objects are generally spearhead-shaped forms with sharp edges that may have seen them function as spear points or knife blades. The younger Howieson's Poort objects are typically no more than a few centimetres long and have been worked into half-circles or other geometric shapes -- they were probably set into bone or wooden shafts as points or barbs for spears and, possibly, even arrows. "What is particularly exciting is that recent research is also now suggesting that some of the Howieson's Poort objects may have been used for arrowheads -- if this is correct then our dating would push archery, and the invention of the bow and arrow, back to 60,000 years ago, perhaps even before modern humans left Africa," said Professor Peter Mitchell. As part of the research Professor Mitchell and colleagues from Oxford helped to take samples of sediment from a number of sites in Lesotho where their excavations had revealed Howieson's Poort objects. These samples, and others, were then analysed by scientists from The University of Wollongong, Australia, and University College London using a luminescence technique that provided the new dates. Oxford University is the only UK university to specialise in archaeological research in southern Africa. Professor Mitchell has been investigating sites in Lesotho for 25 years and believes these findings will stimulate further research into the neglected history of early modern humans in southern Africa.